Do you ever find yourself getting bogged down by your day-to-day tasks and routines? I definitely do! I often get caught up in dealing with short-term problems and forget to continue working toward my long-term goals. This was especially true in 2016. I spent most of the year feeling completely overwhelmed by my to-do list, and I didn't invest enough time in challenging myself to grow and achieve my goals. As we head into a new year, I'm making it a priority to step back, reflect, and reevaluate my professional development goals. What does professional development really mean? Professional development helps you perfect your skills, maximize your knowledge, and advance your career. It's about learning, growing, and creating opportunities for yourself. You are never done learning and growing—it's a lifelong process! You've probably heard that professional development is important about a thousand times, but why is it so important? Why do we care so much? We care because your professional development has an enormous impact on children! It takes a special kind of person to work with young children. It also takes a great deal of training and education. No matter how much education or experience you already have, you can always learn more. A lot happens at the beginning. Children have a little over 1,800 days from the time they are born until they start kindergarten, and 90% of brain development happens during this short time! With so much development happening, children need quality early care and education to thrive. That's where you come in! The future is in your hands. Your ability to do your job well is critically important. Your actions and decisions can promote a child's healthy development or cause harm that lasts a lifetime. We have a responsibility to children. Research shows that high-quality early learning environments build a solid foundation for later achievement and citizenship. The outcomes of your work have far-reaching, society-wide implications. We have a responsibility to each other. As an early care and education professional, you need to be able to grow your own future by earning a livable wage, building job skills, and advancing your career through professional development. Time for an attitude check? Your attitude toward professional development and ongoing learning is just as important as your current knowledge. Do any of these sound familiar? You've been in the field so long that you've lost some of your passion and spark. You're new to the field and feeling overwhelmed. You have a life outside of work and just don't have time. No more complaining. Your job requires you to participate in training sessions and program events. Since your job's first responsibility is providing coverage for the children, most of your meetings and trainings may be at night or on the weekend. It can be hard to get excited about attending training when you have worked all day, but if you get involved, and you may actually enjoy yourself. More important, you may learn something! Have fun! Fun reduces stress and tension and allows you to be more creative, playful, and open-minded. Fun also helps work become more manageable and rewarding. That doesn't mean you're laughing every minute of every day. However, nothing saves you from exhaustion and defeat like a sense of humor. Take care of yourself. In order to take care of others, you need to be physically and emotionally healthy. Early care and education is a demanding profession, and it's easy to become tired and burned out. Many of us have a hard time getting out from under the weight of our work and forget we have lives of our own to tend to. Make sure to find time to take care of yourself so you can give your best to the children and families that you serve. 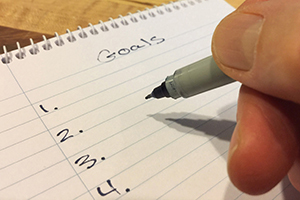 The first step in planning your professional development is goal setting. Without clear goals, you are more likely to stand still and not go anywhere. What aspect of your job gives you the greatest satisfaction? What aspect of your job is most frustrating? What keeps you from being as effective as you would like to be in your job? If you had the power to change one thing about your job, what would you change? What new skills or knowledge would you like to learn this year? Personal. Your goal needs to be about you and for you. You can't set goals for someone else, and it really doesn't work well if someone else tries to set goals for you. Positive. An effective goal is expressed as a positive statement—it defines what you want, rather than what you don't want. Compelling. Your goal has to matter to you. It must be something you're drawn to and really, really want to achieve. Possible. Effective goals are possible to achieve. You have to feel in your gut that the goal you've chosen is doable...even if you aren't quite sure how you're going to do it. Keep in mind that "possible" doesn't necessarily mean "easy." Specific. A goal is specific and measurable. You have to know with absolute clarity what it is that you're trying to accomplish if you want to achieve it. Time-bound. An effective goal specifies a time by which your goal will be accomplished. Don't think of learning as a chore. Think of learning as an opportunity, a privilege, and a great joy. It's your responsibility to continue to grow and develop as an early care and education professional. You deserve to head into work each day feeling fully absorbed in and enthusiastic about learning—the children's and your own. You owe it to yourself, the children, and the families that you serve. I challenge you to take some time to think about your goals for the upcoming year. Looking for more guidance or resources to help you get started? The Child Care Aware® of North Dakota Professional Development team is here to help! Don't hesitate to reach out to us by calling 800-997-8515 (press 2) or emailing training@ndchildcare.org. Search and register for training to advance your professional development goals.